Update: Well it seems today is a good day for I am Arg! A lot of you have probably come here from Scott Ferguson’s awesome comics (Nerf-this, MotoKool or Scout Crossing) and if you happen to be one of those people that didn’t come here by that means, well check them out because they are excellent. I love the way he colors his strips. Also an Update: I did a guest comic for the guys at Louder Than Bombs. Those guys Are hilarious and it was an honour to help out some fellow Canadians. Back to the strip blog. Not much happening on the home front here. just making more comics for all y’alls. Lawls, I can’t stop laughing! Your comics are absolutely amazing! You have now reached…”EPIC AWESOMENESS”! sweet one more step and I’ll have taken over the world. Thos ebutts are just there to wind you up, and anyway, you see a button, you gots to press it, I t doesnt matter if theres a whole line of folks pushin g that thing, you know your gonna push it. And I love you for it! thanks dude! woah hey now. Scott is pretty freaking awesome. I want to steal his coloring technique! I really needed to laugh today. I’m glad I could make you laugh! I hope you have great days from now on! Great comic! Just read the whole thing now. Thanks for taking the time I hope you enjoyed every one! Yup, I came from Nerf this and spent the last few hrs catching up here. That Rapscallion! we shall spend many fort nights searching for this pilferer of nomenclature! Dammit she was trying to catch some attention! Oh I hate this. Recently I was waiting for an elevator at the top floor, which clearly had a big green light around the down button – which was the only button, mind – and someone came up and pushed it again. I found it highly insulting. 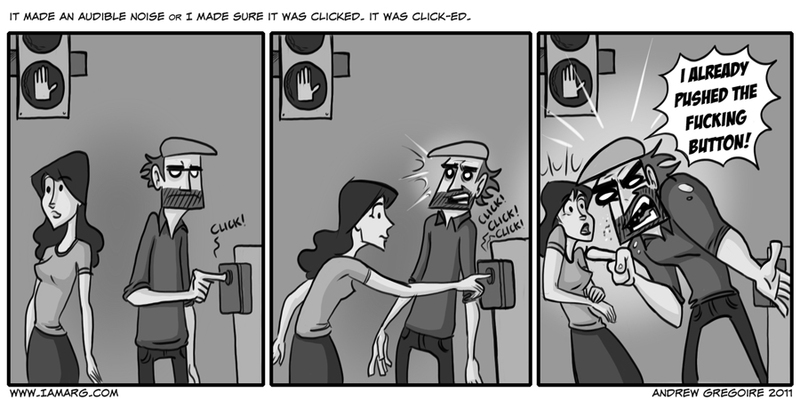 Did she think I was just randomly standing there, too stupid to press the only button available? I was waiting on an elevator one day and a lady asked if I had pushed the call button. I told her no and that I was just hoping the elevator would show up if I wished hard enough. She didn’t even blink and proceeded to press the call button again. Pushing the button resets the command for each push. Sooooo in theory, it is more efficient (and reduces wear) to activate the button just once. Da goobers never quite get it. Push da button once, the little mechanical mind gets the message. If’n y’arn’t sure push it once more. Anything more and it doesn’t change any faster.